Every month, different bloggers host a Carnival of Children's Literature -- links to many blogs with post about a theme. Here is February's Valentine's Edition of the Blog Carnival of Children's Literature. 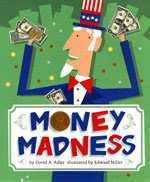 Money Madness by David A. Adler, illustrated by Edward Miller. New York: Holiday House, 2009. 32 pages. Available now. Yes, David A. Adler is a familiar name. He of the young biographies -- A Picture Book Of __________, the latest of that series is called A PICTURE BOOK OF DOLLEY AND JAMES MADISON. He who writes the Cam Jansen mysteries. In fact, author of over 100 books. Is now writing about math concepts -- fractions, polygons, and now -- money. The Holiday House website says: "This beginning guide to economics will have readers thinking about the purpose, and not just the value, of money." Indeed it does. Beginning with the concept of bartering and pointing out how difficult it would be to buy a house in exchange for loaves of bread (bartering doesn't work in that case), Adler examines different things that have been used for money through history. Exchanging little pieces of metal (each having a set value) works well. Paper representing the value of this metal works better. And these days, the best form of money is actually digital. A computer keeps track of what you spend. Illustrated in picture book style. Oh look -- there's information on the back cover about the famous men represented on the various denominations of American money, using a copy of the portrait on the money plus several sentences of information. Did you know that Ben Franklin is on the 100 dollar bill? Who is the other non-president whose face is on our money? Hint -- you probably have one of those bills right now. 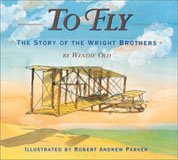 Other Nonfiction Monday posts are linked here at The Miss Rumphius Effect. If you ever wondered about all the strange terms used in publishing, such as Cast-offs, Galleys, Proofs, Mechs, PPB, Arc, F&Gs, CMYK, and so on -- Editorial Anonymous is explaining them over at her blog this week. She calls her posts, Definitions for the Perplexed. Go check it out. On the home front -- the 9-year-old's soccer team finally won a game! She was the team goalie for two quarters and did an excellent job. And me? I finally got some manuscripts in the mail, again. One proposal to two agents and a different story sent directly to two editors. With any luck, I'll get more in the mail, soon. During last fall, while I took that writing course from Vermont College, I didn't send anything out. I simply focused on writing, trying to make myself a better writer. It's going to take me a while to absorb all the things I've learned, but yes -- it was worth it. hits on a holiday, again. And again I forgot to bring a good book to review home with me. The links to many reviews of nonfiction books are today sponsored by the letter - J as in -- they're all over at jeanlittlelibrary blog. Marc Aronson talks all day / everyday about nonfiction at Nonfiction Matters blog. 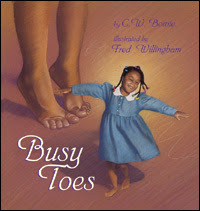 And a group of nonfiction writers blog over at I.N.K - Interesting Nonfiction for Kids. Have fun exploring these nonfiction links. Hmm, It's possible that "wonderfulness" may be a word copyrighted by Fuse #8. I am greatly influenced by her blog. It's a CNN article about how the various Muppets got their characters. I was reading The Longstockings Blog and Siobhan Vivian directed people to this article in her post about Character Development. Last night the 9-year-old and I made Strawberry Sparkle cake for our Valentine's Day meal. partially thaw frozen sliced strawberries. While the other person is mixing the strawberry and jello mixture and waiting for it to soft-jell, you begin taking chunks out of the center of the angel food cake, leaving a 1-inch wall on the sides and bottom. Throw all these angel food cake chunks into the jello, too. Now pour the almost jelled jello into the cavity you have made. Place the top of the angel food cake back on. Let sit in the refrigerator for a few hours or overnight. One of the stars of children's literature worked on THE Major television program for kids -- and was responsible for the look of one of the most famous segments in Sesame Street of all time! The other reason I picked up the book is that I'm always interested in reading about Kevin Clash -- the guy who brings Elmo to life. Hmmmm. Interesting that it says "for K-4 science." 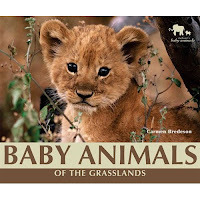 Actually, I would suggest that it was aimed at Kindergarten and First graders because each doublepage spread contains a beautiful photograph or two of the animal, plus 4 or 5 sentences about it. Then on to the next animal. Those few sentences do a good job summarizing each animal. The photographs not only show the baby animal, but also places it within its family group. Extremely useful for a K or 1st grade classroom collection -- if your budget allows. If not, then plan to borrow the library's copies for a few weeks. Your public librarian can track down extra copies from other branches for you. For more Nonfiction Monday book reviews, click here. If you want a link to a new site that recommends good books to spark a kid's love of reading, you might want to check out James Patterson's new site. It turns out that this New York Times best-selling author discovered that his own son had become a reluctant reader. 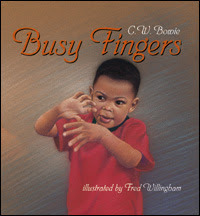 So he came up with the idea of creating a website featuring wonderful books kids actualy enjoy reading. And he hired Children's Literature consultant Judy Freeman (author of Books Kids Will Sit Still For) to post 20 reviews a month. Anyone who has heard her talk about books catches her enthusasiam for them -- and her written reviews reflect this, too. The site is being run by an impressive Board whose members include book editors, publishing executives, and other people connected to the bookselling world, plus Judy Freeman, herself. Here's an article in Publishing Weekly about this website. Is Patterson's son still reluctant to read? No. He's happily devouring books, again. I usually don't review my own books for Nonfiction Monday, but today I couldn't resist pulling some nice nonfiction facts from it. A sunny day in February usually means that a cold front with High pressure has arrived. Cold and dry. brrrr. It certainly feels like winter is here to stay for at least 6 more weeks. But a warm front, caused by a Low pressure system, brings more moisture in the air causing a cloudy, overcast day -- therefore no shadow. Plus, with the day being warmer, it feels like spring is coming. The German people who settled in Pennsylvania had a tradition of watching for hibernating animals (bears/ hedgehogs) to come out to check the weather on February 2nd, the halfway point between the shortest day of the year in December (the beginning of winter) and the Equinox in March (the beginning of Spring). 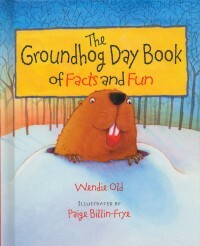 Since there were many groundhogs in the area they settled, they adopted it as the American animal to look for on February 2nd. Did the groundhog in YOUR part of the country see his shadow today? Click here to check Punxsutawney Phil's prediction. Click here to find more Nonfiction Monday reviews. If you are like me, too busy to be able to attend the SCBWI conference which took place this weekend in New York City, then perhaps you'll enjoy reading this blog. It reads almost like twitter entries, giving summaries of what is happening in each session as they happen, except that the entries are a bit longer than twitter. If you begin with the latest entries, it's like attending the conference backwards. I suggest you keep clicking on "older Posts" until you find the beginning of the conference and read forward from there.